Bisola and I hurriedly took these pictures in front of our apartment because she was running late for her flight and I was going to a party!! Dress worn as skirt: Macy’s, Sweater: really old, Necklace: DIY, Tights: Emilio, Shoes: Steve madden, Purse-earrings-ring: Vintage, rings & bracelet: Flea market. On her way to the airport & I'm going to get my party on!! 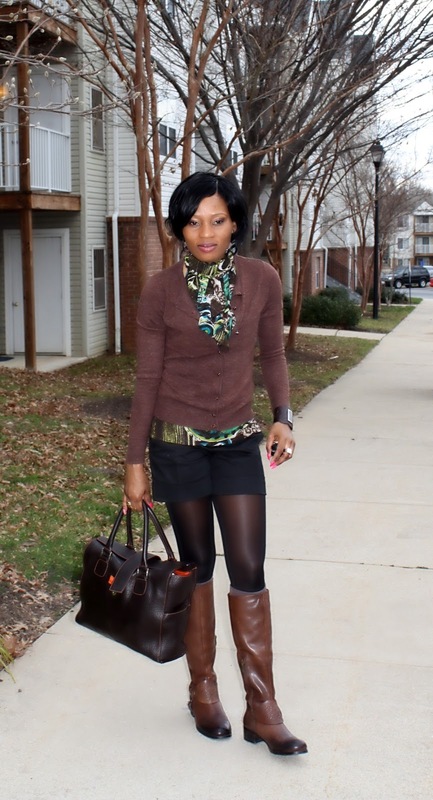 Top & tights: Macy’s, Boots: Vince Camuto, Cardigan: Ny&Co, Shorts: express, watch: Valentino, socks: nine west, ring: Vintage, Bag: Christian. Great outfits, sweeties!Love the gray and red combo! That red skirt is amaze balls! I love the details. The brown boots are pretty fabulous, as well. Both outfits are super cute. You both look FAB! I love the leopard tights and I love the boots! You both look so amazing! LOVE the shoes! OMG ! Your shoes are amazing ! You ladies are so stylish! Love the Bisola's travel attire. Dammie Gee, your DIY necklace is super hot and I would not have been able to work those animal print tights like you boo. FAB! I love this! Your red dress (skirt) is so pretty and those shoes are amazing! I love the brown boots too! Very nice pictures ladies! I always look forward to your next post! Love the tights and necklace. Seriously, you should do a how-to for all your fab DIYs. I love your tights and the dress, awesome outfit :) And Bisola, the print of your top is gorgeous! You two look fantastic! I especially love the red skirt and the patterned top! Besides, amazing how you show the way to catch a flight wearing a comfortable but beautiful outfit. 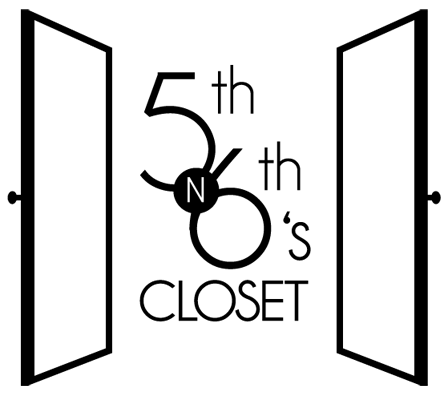 Tsmstyle. Perfect outfits for party and flight, all fabulous. oh wow i love this bright red dress(skirt it looks so amazing and wow you have endless legs, it would be a crime to hide them. you look so absolutely gorgous! Great color and print combos! Loving the red dress as skirt and the necklace! Love the shirt too--both cute! love the red skirt! and the black heels are amazing!! You guys are just killing it lately! I think I need those Steve Madden mary janes...pronto! You ladies have the most amazing style! Loving the heels and the boots! Those leopard tights are super fun!! Of course they look awesome paired with the red bubble skirt! The necklace was just the perfect touch! love the shoes.. the colors are beautiful!! Thanks for stopping bye..feel free to follow me , i will be doing the same. what a gorgeous red skirt! lovely shoes! you look great! You 2 look great girls! Love your shoes girl!! you look is always great!!! ohhh you two look stylish, I can't take my eyes off the satin red skirt! You ladies KILLED it again :) LOVE LOVE LOVE the red skirt paired w/ those awesome tights! & I would totally wear the boots, shorts, tights combo you look chic & comfy! Such stylish sisters, love it! you both are looking sooooooooooo amazing!! Great look! 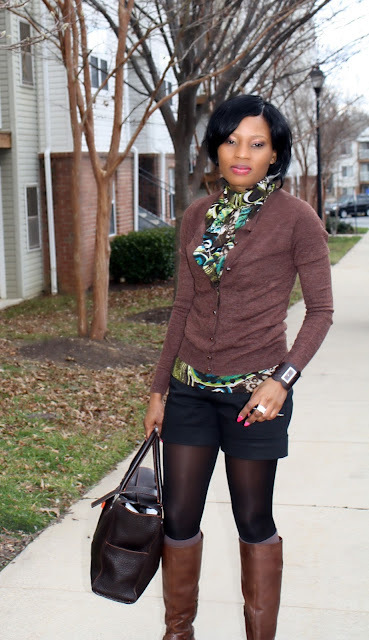 I normally am not a fan of printed tights -- I've never seen anyone style them so well! So beautiful and unique.